Current pledges are not adequate to limit global warming to 1.5 0 C- 2 0 C, says UN Emission Gap Report 2018. The UN Emission Gap Report is a yearly assessment of the gap between global greenhouse gas emission level and the aims taken by the signatories of the Paris Agreement 2015. This year’s report shows a dismal scenario of the emission gap which is contributing to many of the escalating heat waves, extreme storms and droughts that humanity is witnessing currently. The 2018 report also warns that continuation of the current emission gap would deter the world from meeting the level of emission control aimed at the Paris Agreement. 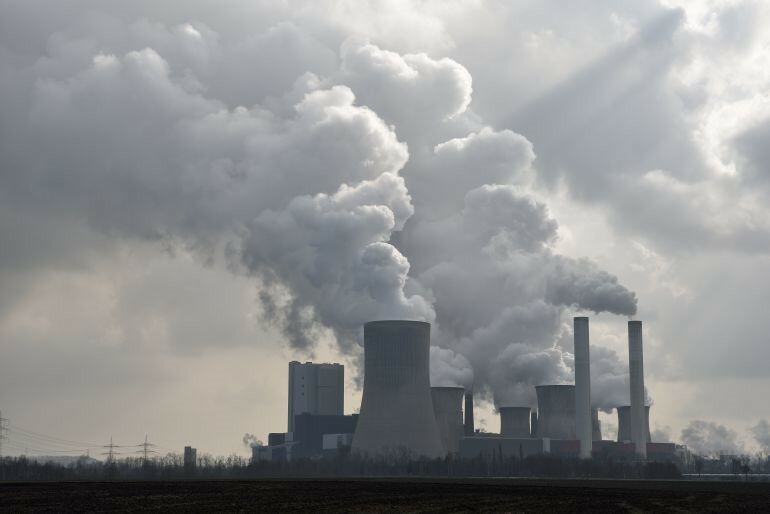 The assessment report was a combined effort of scientists and modelers who measured the size of the emission gap and also explored what can be done in future. The Paris Agreement aimed to keep global warming level below 2 0 C above pre-industrial levels and also limiting temperature increase to 1.5 0 C. Scientists say that maintaining this level is necessary for preventing some of the disastrous climatic impacts. The assessment report says until the countries strengthen their ambition beyond the current NDCs (Nationally determined contributions—the commitments of the countries) require, exceeding the aimed 1.5 0 C level cannot be avoided. Achieving the 1.5 0 C level would require emissions to be cut by more than half from today’s level—from 54 GtCO2e (Giga tonnes of CO2) in 2017 to 24 GtCO2 e in 2030 and by 25% for 2 0 C, i.e. 54 GtCO2 e in 2017 to 40 54 GtCO2 e in 2030. This year’s assessment showed that global emissions from fossil fuels and industrial sources have increased which was stagnant from 2014 to 2016. In 2017, it touched a record high of 54 GtCO2 e.
Peaking emissions by 2020, according to latest scientific assessment, is very crucial to meet the aims of the Paris Agreement. The report, however, finds that even if countries honour their NDCs, emissions would continue to grow not only through 2020, but also through 2030. About three quarters of the global emissions are accounted by the G 20 countries, thus setting the global emission trends. Most of these countries had made pledges for their emissions reduction targets both for 2020 and 2030. Only three countries have not made any pledges for 2020. The report assessed 13 countries with pledges for 2020 and 16 countries for with post 2020 pledges. The report finds that seven countries are on track to meet their 2020 pledges — these are India, Japan, Russia, the European Union, China, Brazil and Australia. Canada and Republic of Korea are the two countries that are not on track to meet their 2020 pledges. 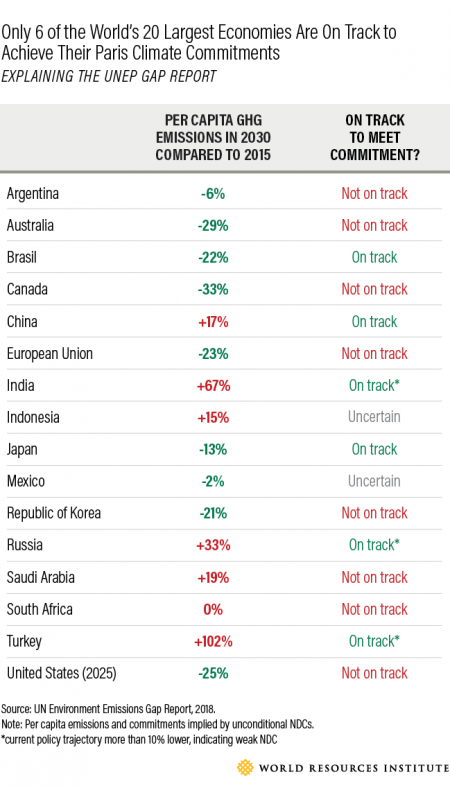 The remainders—United States, South Africa, Mexico and Indonesia are subject to uncertainty. For the post-2020 assessment, the report finds that only six countries are on track, the remainder are off track and uncertain. The report suggests that there is an urgent need of must increasing the climate commitments by the countries, with exploring and including more policies that have not yet been adopted widely. Addition of more emissions reduction targets and making the existing policies like that of renewable energy and industrial energy efficiency more stringent is also suggested by the report. Accelerating innovation in the existing technologies combined with the behaviour in promoting investments in new technologies along with market creation, suggested by the report, has the potential to reduce greenhouse gas emissions of the countries. In the globe, there lies a great temperature difference between the poles and the tropical areas.